FITNESS MANIAC Neoprene Dumbbell take your fitness to the next level. Whether you work out in a commercial gym, studio or from the comfort of your own home, this versatile piece of equipment can be used to build up a sweat and work numerous muscle groups. Its unique hexagonal shape prevents the weight from rolling across the floor and allows for easy tacking if you possess more than one. Each hexagonal dumbbell is covered in a durable neoprene material that provides a soft and comfortable grip around its entire surface area, so you can workout without having to worry about the weight slipping from your grasp. The dumbbells comes as Pair in Pink color and each dumbbell weight is 2LB (Total weight 4 LBS). Fitness Maniac durable dumbbells non-slip neoprene coating is easy to grip and easy to clean. These weights can be used to elevate the efficiency of other fitness routines such as jogging and power walking, aerobics, general exercise, physical therapy and even yoga routines. The colors-coordinated weight increments let you grab just the right dumbbells for your chosen workout. The hex-ends allow for easy stacking and convenient storage. Weight designations are printed onto ends of dumbbells. The hex-ends allow for easy stacking and convenient storage. 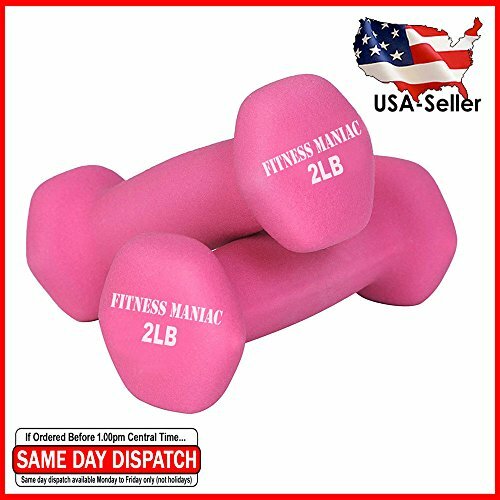 The dumbbells comes as Pair in Pink color and each dumbbell weight is 2LB (Total weight 4 LBS).